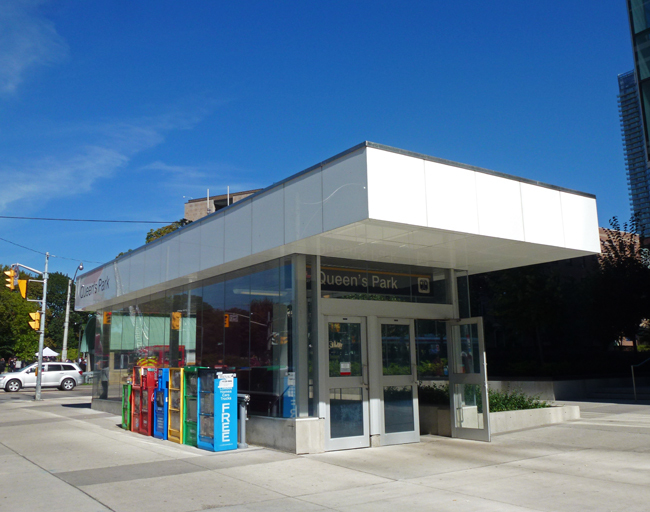 Most of the entrances to our subway system are simple sets of stairs that lead down from the sidewalk but this one at the Queen's Park entrance is quite sleek and modern. I think it was rebuilt as part of the major construction that took place beside it a few years ago. Obviously another pic from warmer times! Lovely warm day by the looks of it and a very modern station! That is nice! I would not have known it was a subway entrance. Hello, it is a nice modern looking entrance. I am thinking warm today! Very nice, and I like the colorful boxes at the side! Newspaper boxes? It sounds like it's more substantial than the usual entrances Pat? It looks quite new. I haven't taken the subway system there often, but I don't recall ever getting off at that station. Subways are such a great way to travel around cities. This looks like a fine entrance. I like it. It's even sheltered for less pleasant weather. Where are the gas pumps? I just wish we had subways! I'll take most any kind of station although this one would certainly get my first vote! I do like straight lines. Makes sense to enclose them and to protect the stairs/escalators as well as the commuters from the elements. I thought it was a fast food place, never would have guess it was an entryway to the subway. I'm enjoying your "nice and sunny" scenes. This is definitely a new look. Nice! I like how they designed this! Clean, sharp lines with no architectural clutter. Curiosa. No parece una entrada de Metro. Parece más una entrada de una tienda.